On a beautiful Tuesday night, we take the chairlift from the village of Abisko towards the top of mount Njullá. It’s cold and crisp, the full moon is out, and the stars are abundant. We see a faint green glow but nothing exceptional. Not just yet. In the chair lift, we talk about our hopes and fears. Maybe the moon is too bright tonight for good northern lights spotting? Maybe there will be no show what so ever? “After all it’s still nature, you know”. It’s that anticipation, but also the fear of being too enthusiastic. To jinx the night. But at least we can agree on that we have good chances, with an almost perfect cloudless night. And in the comfort of the overalls – handed out by the nice people at the chair lift – we are sitting in warmth although it’s a bit of a cold night. 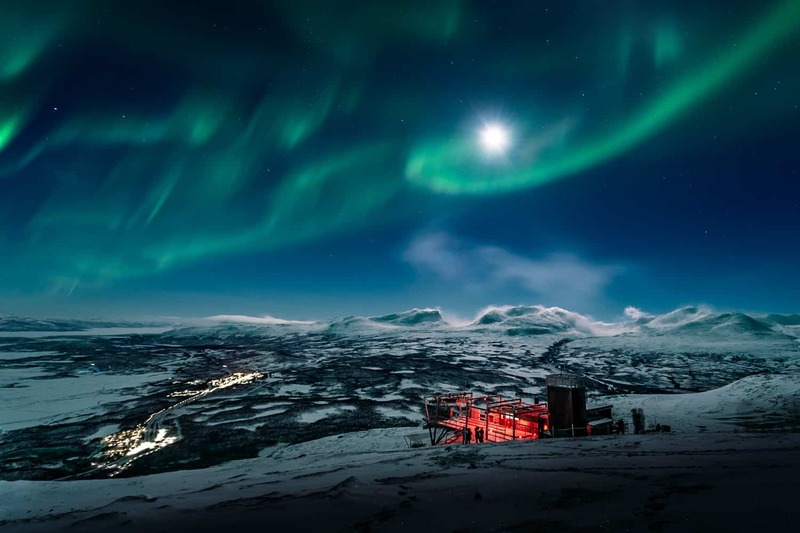 Already in 2015 Lonely Planet dubbed Abisko as the world’s most illuminating experience. Giving the northern lights in the village up north all that acknowledgement, that the buzz had been about for years. On any given day, between November and April, you can take the chair lift to the top of the mountain Njullá just to watch – and maybe photograph – this incredible light show. Nature’s own salute to tell you everything is alright and your iPhone will also work tonight. Because, in and in the vicinity of the Earth’s both poles, there’s a good chance that you might witness a green, blue or red light in the shape of drapes, curves or rays dancing across the sky. It is particles from the sun colliding with the outer parts of the Earth’s magnetic fields in the atmosphere, whereby the kinetic energy is transformed into visible light. And without this magnetic shield, it’s a good chance our electrified life on earth would struggle big time. 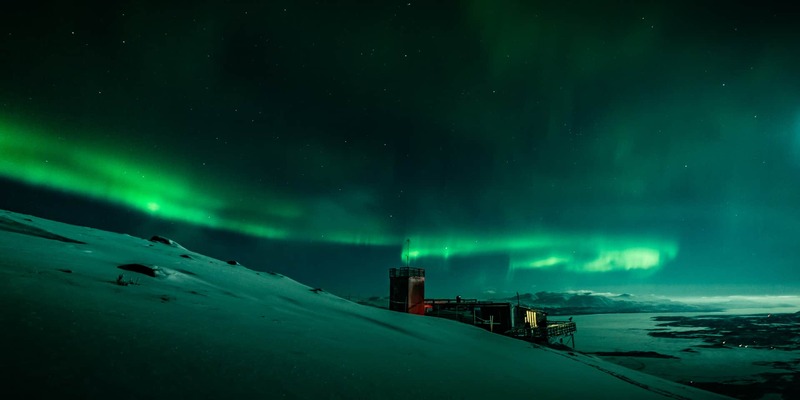 In the northern hemisphere, we call it the northern lights or Aurora Borealis, while you around the South Pole will experience Aurora Australis. Turn off all your artificial lights and gaze up into the sky – no, space, and you can witness the sun’s greetings reaching us on Earth. There is a couple of things to take into consideration for your successful aurora chase. Up north, Kiruna to Abisko, under the auroral oval, it’s not so much about whether it’s northern lights or not, more if it’s clear sky or not. So talking about a northern lights chase is more about chasing clear skies. Situated on Mt. 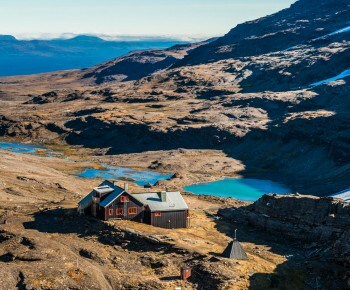 Njullá, 900 meters above sea level, is Aurora Sky Station, in a spot with very few distracting sources of light or sound. The station has no running water and no electricity but still invites you to experience a great four-course dinner or just a late night coffee. 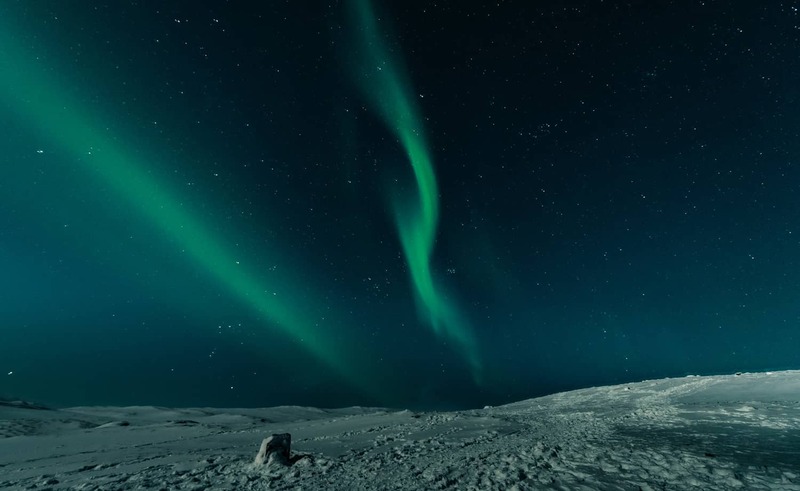 And when, following the United Nations proclamation of making 2015 the International Year of Light, Lonely Planet listed the world’s ten best places to experience light they chose Aurora Sky Station as the best place to experience Northern Lights. And, to be honest, nothing has really changed over the years. Aurora Sky Station is still great. A visit to the sky station during the late evening, or night, starts with a 20-minute chairlift ride up the mountain, cosied up with warm overalls and shoes provided by the staff. And don’t miss on the details with dressing warmly. It could be a long wait outside to get what you want. So sitting there in the lift our eyes gradually get used to the darkness and more stars than you’ve ever seen start to unveil. Then the faint green glove you saw down in the village groves, and before the ride is over, we are lucky to be greeted with the most incredible northern lights. There is a large terrace connected to Aurora Sky Station and a viewing tower where you can fully take in the view. But it seems like all people up here don’t have time to do anything else than just standing and looking up into the night sky in awe. It’s an absolutely amazing northern light display for a while. And when it slows for a while, we head on into the café for a cup of coffee and some snacks. Inside is a northern nights exhibition where you can learn more about the phenomenon – just imagine yourself following the sun-charged particles enter the Earth’s atmosphere, get to know how they get caught by magnetic fields who push them towards the Earth’s poles. Just hop on one of the daily tours to learn more about how the interplay of the Universe makes it come about. 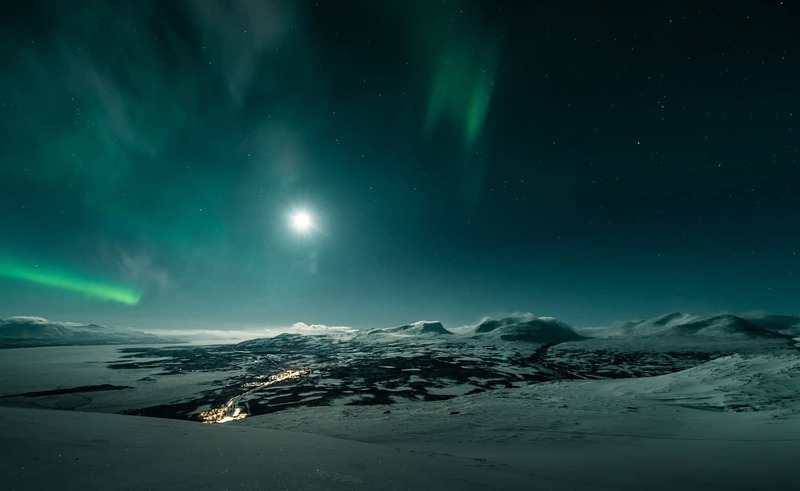 It is possible (and highly recommended) to make a table reservation at Aurora Sky Station, they serve a delicious four-course meal inspired by the taste of Swedish Lapland. Today the guests tell me about perfect arctic char and slowly cooked moose. And I understand that I missed something. Here is also a quaint little café where you can get a cup of genuine ‘kokkaffe’ or boiled coffee, and of course, the perfect place to experience the Swedes favourite pastime. A typical Swedish “fika”. Abisko National Park is about 100 km northwest of Kiruna. There are daily flights to Kiruna where you can continue by train or bus. Also, look up transfer options provided by your accommodation. 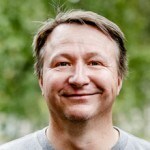 The chairlift up to Aurora Sky Station departs from STF Abisko Turiststation and takes about 20 minutes. 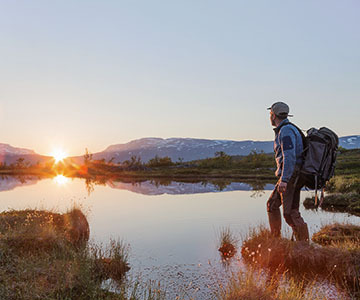 In summer, you can experience the Midnight sun with equally breathtaking views. 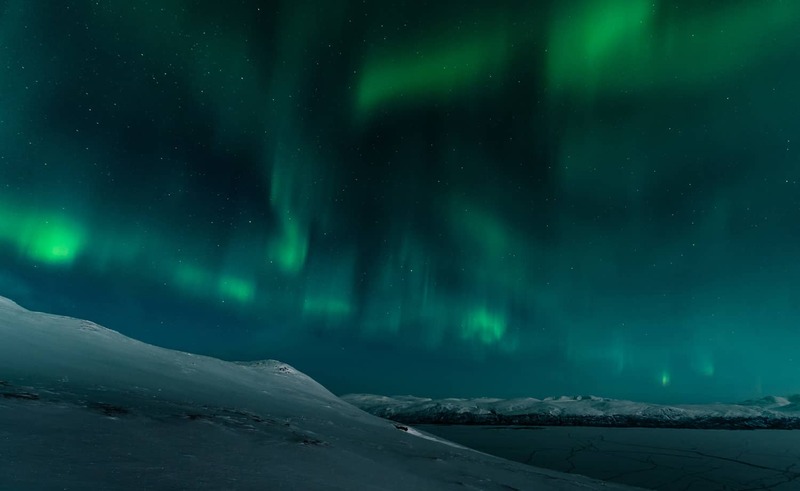 So, as already mentioned, Abisko is situated in the centre of the Aurora oval and is considered to be the best place in the world for experiencing the northern lights. With the clean air, the usually clear sky and no light pollution, the conditions are just perfect. 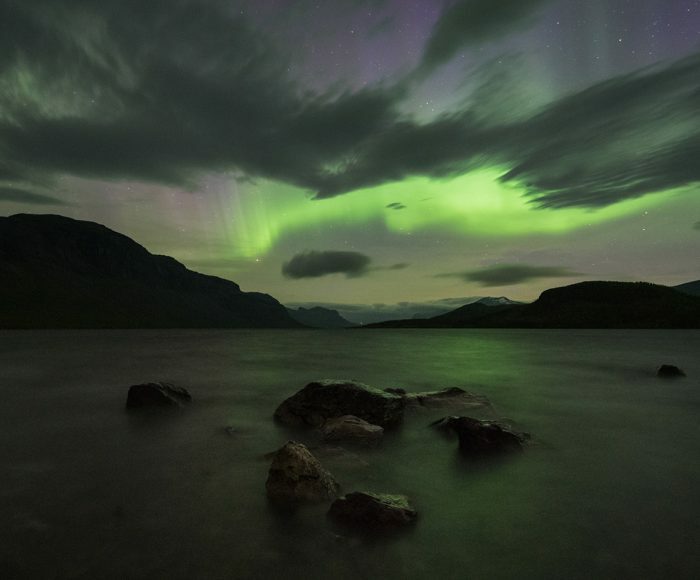 You can catch more or less active northern lights in these parts every night from October until the end the March. Here it’s not about the auroral activity, here it is about clear skies. And, it usually is clear skies in Abisko because of the fact that this area receives less rainfall than the rest of Sweden. And even if this is just about plain statistics, the fact remains, in Abisko you often have a blue hole even if the rest of the sky is covered. 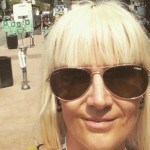 So we get out, after our “fika”, when we’re starting to feel a bit too warm inside the cosy environment. Outside two faint patches of green are seen right above us. Just like last time the show started. And before we know it a new magical northern light display is seen. All the different colours. People all around are cheering and shouting, and you can feel people’s relief and happiness in the air. It’s really not difficult to understand why this is called the world’s best.